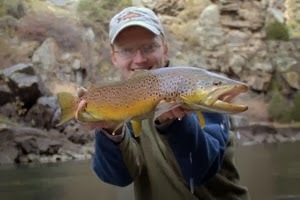 The Trout Zone: Don’t Take My Picture!!! When I go fishing, I almost always carry a camera. One never knows when the perfect photo op will present itself, and of course there is always the possibility of catching a truly memorable fish. If there’s one thing I’ve learned about photographing fish however, it is that you can never expect a fish to just roll over and pose. 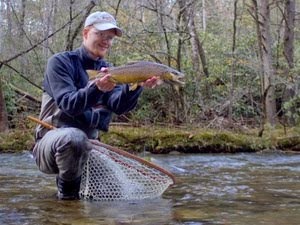 This presents a problem for the conscientious angler: how do you achieve the balance between getting the perfect shot and yet not compromising the life of the fish in the process? 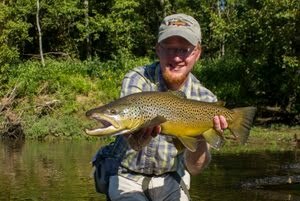 There have been times where I’ve caught a nice fish but because of a variety of factors decided the shot was just not worth it. Perhaps the fish was acting severely stressed or the water temperature was quite high. Sometimes I feel like I didn’t play the fish fast enough and it just needs to be returned to its natural state as soon as possible. Often though I manage to come up with a decent picture. 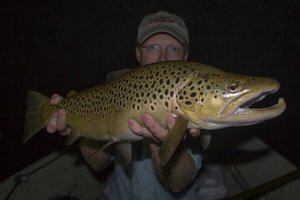 There are a few things I try to keep in mind with respect to the health of the fish. First I always wet my hands before touching the fish. Too many times I’ve seen first hand the ugly result of improper handling. The fish will soon have nasty white spots where the mucous membrane has been damaged or removed if you are not careful. Second, I try to keep my fish in the water as much as possible. Many of my shots are taken with the fish laying on its side near shore, and these shots are always done either with the fish still lying in shallow water or on a wet bed of moss or grass. Fish should never be placed on dry dirt, rocks, or anything else streamside. Finally, I try to keep fish off of rocks that are not either in the water or more than a couple of inches from the water. If the fish starts flopping it can hurt itself if it doesn’t reach water immediately. Once again, the great shot is just not worth killing the fish. Of course, sometimes in the excitement of the moment you still place fish in a less than ideal position for the photograph. 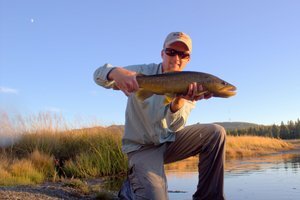 I’ve done it plenty of times myself but by trying to remember the fish, you can usually get a good shot and keep the fish in shape for the next contest. Do you leave your optio on a certain setting all the time or switch it up? I have a w20 and it seems to take alot of blurry pictures, especially the shots i want! Ha - those are some of the best photos...they certainly tell a story!